Fork Extensions are an excellent choice for your material handling attachment arsenal. Fork extensions are the best choice when your pallets are abnormal or larger than your forks. 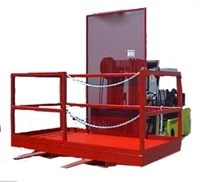 They allow the operator to safely lift your product and relocate them with ease. Fork extensions are also the best option when new forks aren’t in the budget. Installation is easy, simply put the forks through the stirrup of the extension and lay it down on the fork. Optional reinforcement should be added when the desired extension length is greater than 1 1/2 times the fork length. When ordering, please provide fork width, length and desired fork extension needed. The Medlin trailer spotter allows you to safely move trailers big and small around without attaching a truck to it. Medlin provides multiple spotter designs as well as end attachments to fit all industry needs. The Medlin Jib Boom is the perfect way to lift equipment out of tight areas. Fabricated with heavy duty carbon steel and meets all industry standards. All jib booms are built to fit your operation, as we know there are many different applications. Comes with a safety chain and swivel hook and shackle. With capacities from 500lbs to 6000lbs we are sure to have the right boom for you. Standard pockets will accommodate up to a 2″ x 5″fork. Custom pocket sizes are available upon request. The safety chain keeps your boom secure during operation. Standard color is safety red.